To hearken a favorite melody from Journey, some boys in Philadelphia didn’t stop believin’. Having watched their favorite sons of the gridiron manage a full 60 minutes of hearty competition while emerging victorious, the repetitive thud you heard late last night was surely the sound of close to 2 million inhabitants of the City of Brotherly Love simultaneously jumping up and down as their beloved Eagles became Super Bowl Champions for the first time in history. Rumor has it the entire city will be maintaining an ear-to-ear smile and whistling Zip-a-Dee-Doo-Dah for the next several months; an affliction which surely extends as far south as the beach in New Jersey, and as far west as Chicago. For you non-sports fans who have little to no idea what to make of this so far, fret not. Please just take comfort in the fact that your stock in Advil and Tylenol will be on the rise this week as sales are booming. This morning, as I was perusing the inter-webs of the sports world, enjoying the details of the Eagles victory mixed in with a few facts of the upcoming baseball season, I came across this small excerpt from a newspaper in New Braunfels, Texas. In 2006, Westlake QB Nick Foles lost 35-28 to the Seguin Matadors, which ultimately cost the Chaps a district championship. Eight weeks later, Westlake fell 43-29 to Southlake Carroll in the Class 5A Division I State title game. After a stellar collegiate career at Arizona, Foles made it to the NFL and earned a starting job with the Eagles only to be traded to the Rams in 2015 for Sam Bradford. He only spent a year there before joining the Chiefs in 2016. He returned to Philly prior to 2017 as the insurance plan to franchise starter Carson Wentz. The lesson? Don’t stop believin’. Both Westlake and New Braunfels are less then 90 minutes from my front door, and it just so happens, I currently have a TON of adolescent boys who enjoy sports in Vision Therapy. Can you see where this is going? I hope so. Aside from eyeball movements and understanding what we see, Vision Therapy offers therapists the opportunity to inspire, to encourage, to reassure, and even offer a pat on the back as we watch success develop. Some days we even have the opportunity to remind patients of the many doors available to them and the hard work needed to get there, irrespective of previous failures. These ideas can be tough to associate with when you’ve experienced nothing but struggles in school and difficulty in sports, but perhaps not as much when you see someone succeed on the biggest stage following many failures of their own, especially if that person is from your city. 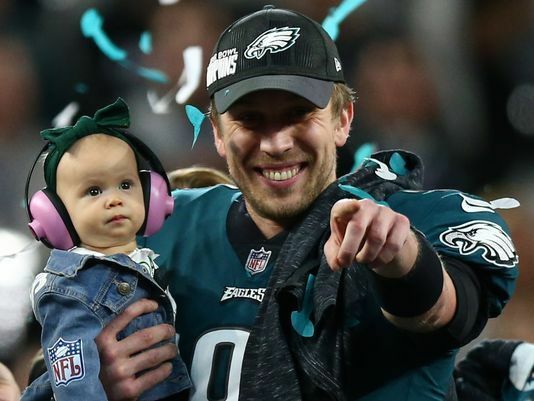 Here are some of Nick Foles’ finest moments from Sunday’s game, a historic performance which led to his being named the MVP of Super Bowl 52. He is but the latest proof positive that failure is temporary, and success by way of hard work and perseverance lasts forever. Posted on February 5, 2018, in From My Perspective.... Bookmark the permalink. 1 Comment. Yes, there are many components to the success of therapy patients. They improve their vision and, for therapy to be successful, they also need to have grit, perseverance, and develop a growth mindset. Good therapists promote all of that and it changes lives.